The Naval Militia | "Welcome Buddies"
Fig. 1 Sarasota Naval Militia in black uniform, 1917. Fig. 2 Sarasota Naval Militia in white uniform. In the Sarasota-Times, references to Sarasota forming its own fighting force began as early as November 12, 1914. According to that day’s issue, Colonel J. Hamilton Gillespie, “known for years as the ‘golfing mayor of Sarasota,’” had recently begun drilling soldiers from Sarasota to join British forces in France.1 This article provided no details as to what kind of force these men would constitute. Over the next year, however, the paper published occasional calls for Sarasota men to join a local naval militia. Rapidly made for itself, amongst the rest of the Camp, and also amongst the officers of the regular service at the Yard, the reputation of being the best Naval Militia Division in camp. This in all ways and things appertaining to Naval Service. The Lieutenant provided updates on the few individual soldiers he knew about. Though there is no more available information on the duty of the sailors, we do know that all but one, Horace W. Mink, came home to Sarasota alive and well. Fig. 3 Sarasota-Times, September 5, 1918. Fig. 1. 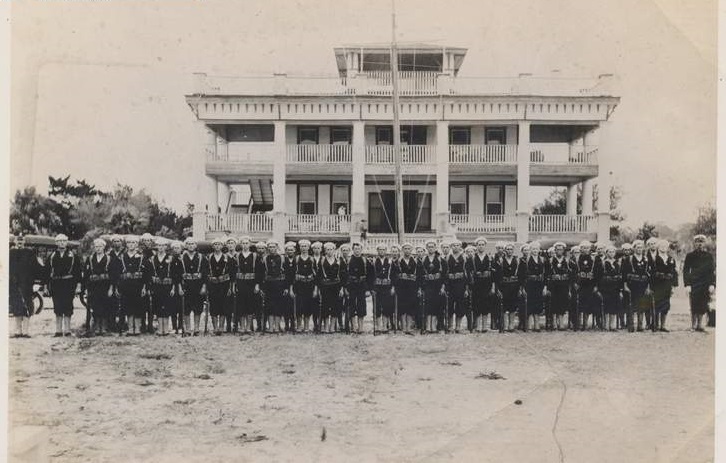 “Sarasota Naval Militia in Black Uniform, 1917” photograph, courtesy of Sarasota County Historical Resources, Sarasota, Florida. Fig. 2. 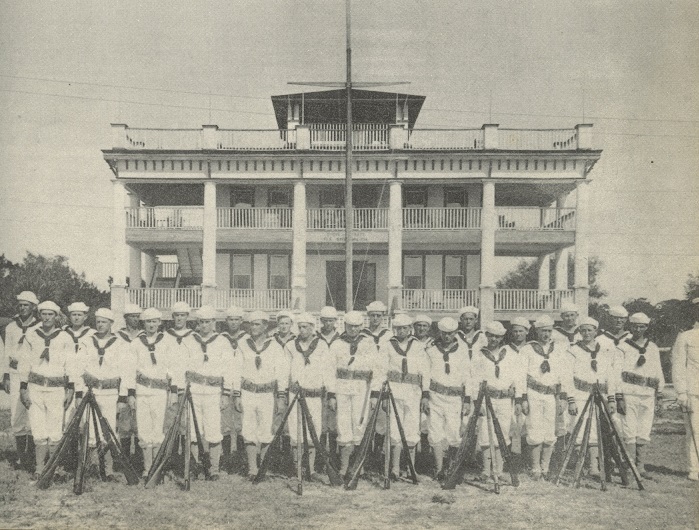 “Sarasota Naval Militia in White Uniform,” photograph, courtesy of Sarasota County Historical Resources, Sarasota, Florida. Fig. 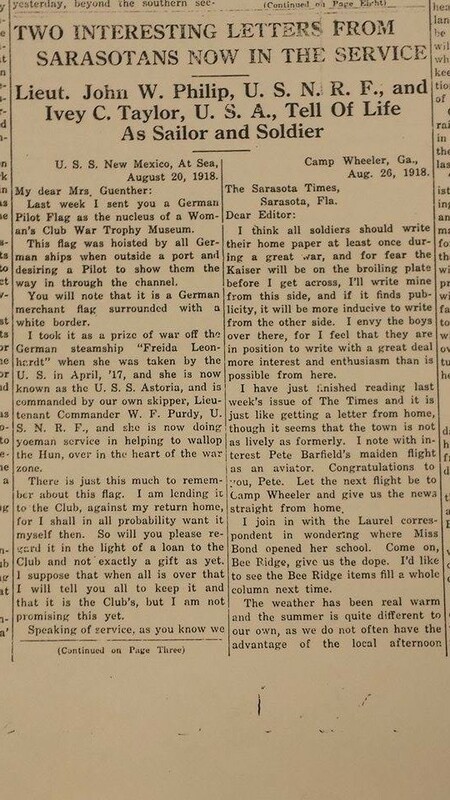 3.”Two Interesting Letters From Sarasotans Now In The Service,” Sarasota-Times, September 5, 1918, courtesy of Sarasota County Historical Resources, Sarasota, Florida. “Col. Gillespie Drilling Soldiers,” Sarasota-Times, November 12, 1914. “Five More Men Needed To Make Sarasota’s Quota In The Florida State Naval Militia Complete,” Sarasota-Times, May 25, 1916. “Smallest City in the U.S. To Have a Deck Division Of A State Militia, And That Is Sarasota,” Sarasota-Times, June 22, 1916. “Naval Militia,” Sarasota-Times, July 13, 1916. “Sarasota Naval Militia Leaves For Charleston,” Tampa Tribune, April 7, 1917. “Two Interesting Letters From Sarasotans Now In The Service,” Sarasota-Times, September 5, 1918.